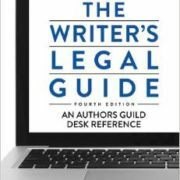 The Writer’s Legal Guide is an indispensable resource for all writers who want to protect their work and succeed in both traditional and digital markets. Authors Guild Members receive electronic access to the entire Writer’s Legal Guide upon logging in. The Writer’s Legal Guide is an indispensable resource for all writers who want to protect their work and succeed in both traditional and digital markets. Purchase your copy of The Writer’s Legal Guide. Authors Guild members have electronic access to the chapters of the book available below.